Man, there has got to be a better way to make a living. Over the last few years we have been to a few rodeos and it always amazes me that cowboys do this. 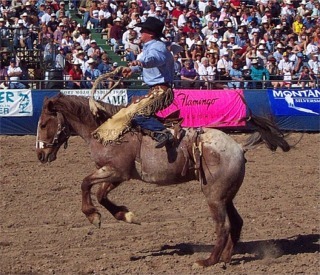 In Laughlin they have a yearly event called the Stampede. This year it happened to fall on Easter weekend. It was a great time to visit Laughlin as the temperatures were very nice. Low to mid 80's during the day. 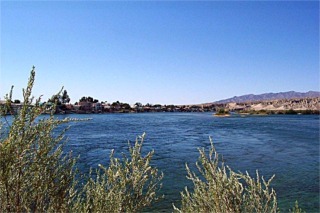 Laughlin averages less then 2 inches of rain per year and over 300 days of sunshine. Temperatures can be pretty high in the summer. Well into the low 100's. We've been there<grin>. 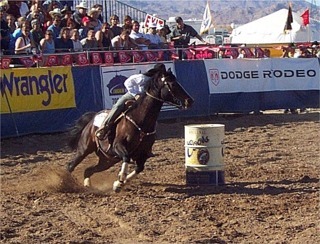 This is the barrel racing event. As far as I can tell this is the only event the ladies participate in. I don't know if they can't participate in Bull riding or if they are just smarter then the men and know to stay off the Bulls. This guy is looking for something or somebody. and these guys are what he finds. They called this event cowboy poker. 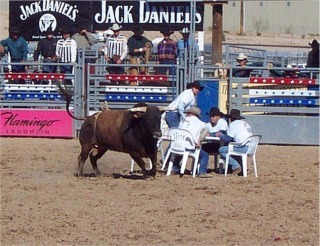 They sit at a table and then the bull is turned loose. The last person to remain sitting wins. 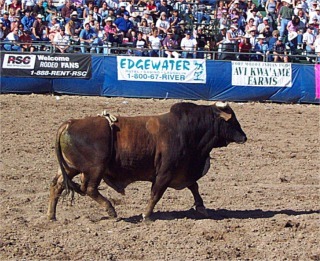 He may not only win the money but a trip to the hospital after the bull mows him down. This picture was taken in Riverside casino. They have an antique car museum there. This is one of only 4 corvetttes made the first year. 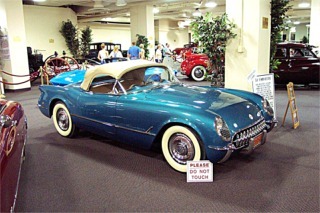 It was more of an experimental or concept car. Not only do they show cars here but there are usually a few of them for sale. This is the Colorado river just outside of town. The river is very beautiful. To sit and watch it you are surprised at how strong the river current is. This trip we rode the river taxi one night to go to another casino to watch an outdoor concert. It was very pretty to ride the river at night looking at the casino lights. One of these days we are going to rent jet skis and cruise the river.